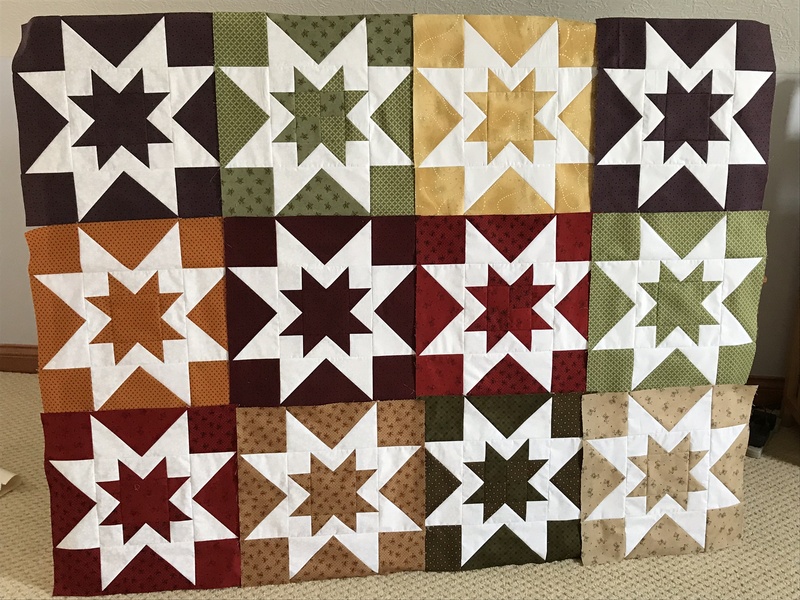 My DIL requested a Christmas lap quilt for their “new” 1890 farmhouse they are renovating. She chose this pattern, and we decided on Christmas Gatherings fabrics. Maybe I have been staring at it too long, but it just isn’t speaking to me. On the other hand, I don’t make 16” blocks and I lean towards traditional patterns. Pattern does not require a border, and I am trying to resist....blocks are not yet sewn together-they have been sitting on my design board for awhile........the darkest blocks are actually a deep purple and deep red. Quilt top will be 64x44 if I stop here. I like it too,the colors would fit in with a farmhouse look,very nice. Keep going. I wouldn't call it a modern quilt, that's a traditional block. Could it be that it has no one color that "pops"? BTW: I like it. If you want a border, put a border on. It is lovely though. no matter what. I love it, but I'm a border kinda girl. If you want a border go for it. I don't like many of my quilts at this stage. When I finally finish them and they are quilted, they are much more pleasing to my eye. 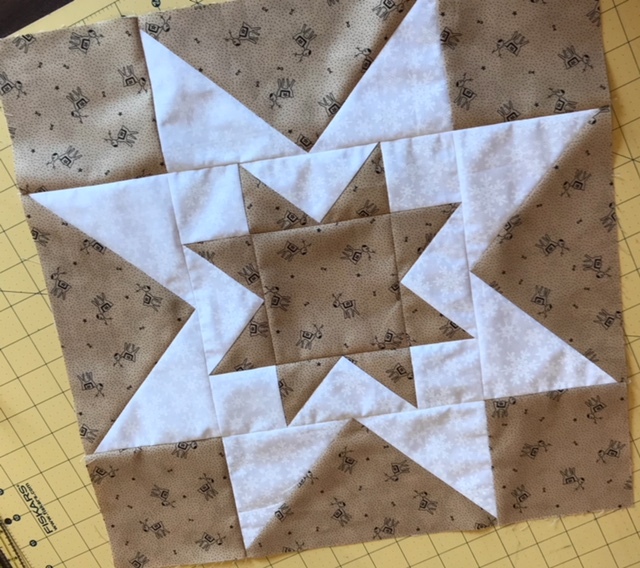 If you want it to look Christmasy, then add a small stop border - maybe the white background in each of the stars or see if a glitter fabric would look good, and then frame it with the dark red for the outside. If you still don't like it, look for something you can applique across it. Perhaps Santa and his sleigh, maybe Merry Christmas. Good luck. I don't see this as "modern" if your intent is modern maybe arranging the colors in a more purposeful way instead of scrappy? It looks fine to me though. No border. I haven't seen many modern quilts with borders. The contrast of the dark colors is the modern part of this quilt. Modern quilts seems to be stark and sleek. So Stark Stars is what you have achieved. Very nice. I think your result is very pleasing, and I would go ahead with it, especially as your DIL chose the pattern and you decided on the fabrics together. If the quilt is the right size without a border, I do not think it needs one. I think what you might be experiencing is the dissonance of reproduction fabrics used in a more modern-sized block. I've had the same reaction with a couple of quilts, and now I try not to pair reproduction fabrics with more modern patterns. One tends to see these kinds of fabrics in smaller pieces, whereas modern fabrics with larger designs are made to be cut in larger pieces. I love it. More traditional would probably have a sashing. Maybe that is what your eye is missing. But that is what your DIL wants. For starters, I think a 3 x 4 arrangement of non-matching blocks is challenging - for me, anyway. The yellow block catches my eye - it seems a lot "brighter" than the rest of the fabrics. The blocks that you used three fabrics instead of only two fabrics are more "interesting" to me than the blocks that you used only two fabrics. The colors of the yellow, light olive green, and the light tan block (lower right corner) seem "light-weight" compared to the "denser/heavier" feeling of the other nine blocks. I prefer a larger sized "couch quilt" for snuggling under - but if it's only to cover a lap - or to be a decorative piece - or for a little one - it's an adequate size. But other posters are correct - after it's finished - a quilt usually seems to be "perfect" - and if it's being used - it's definitely "very perfect". I love it. What pattern is the blocks, if you don't mind me asking? The only thing I would do is move the two beige-y colored blocks away from each other, and bind it in red. I think it is very nice but I feel it is modern too. What would happen if you did big stitch quilting with darker stitching. I think it would tone done the white which hops out at me. I think the 48x 64 is a fine size for Christmas, decorative use but I agree with others that a border would be fine too if you want it larger. I love your blocks and the fabrics you chose. Maybe if you finish putting the blocks together you can audition different fabrics and see if you would like a border or not. Love the pattern-would you share the name of it? Thank you for all of the feedback. She wants a modern quilt, and I guess I will add more blocks and hope for the best! I can’t ask her if she likes it, because she will say yes, even if she doesn’t! The pattern is Aurora Borealis, by Susie Ledadom. So sorry that I forgot to put that in the original post. When I only had dark blocks made, it really looked gloomy to me, so I added a few lighter blocks. The one yellow/ gold at the top is not the same fabric line, and it may be replaced. But it does brighten it up a bit! The blocks with 3 diff fabrics are my faves, but I don’t think this line of fabric has enough contrast....I may try again when I make more blocks. Thanks again....always good to get unbiased feedback! I think it will look terrific in her farmhouse. More blocks, no border. I agree, I think my eye wants it to be sashed. I am a border girl...I think I would look for an appropriate fabric that encorporates all of these colors. Maybe share that with DIL? She might want it bigger....? Maybe rearrange the blocks, you may like it better. I would prefer a border, if it were mine. I think it will end up very pretty. I really like it and I don't think it needs a border. I really like this block and looks good to me. Maybe try putting the blocks on point? The corner pieces may give you what your missing in terms of appeal instead of a border, per se. It would change the look of star but it's worth playing with it at this stage.